Toronto, Ontario--(Newsfile Corp. - October 4, 2018) - Palamina Corp (TSXV: PA) has conducted a reconnaissance sampling program in the recently defined Cayos gold zone south of the Veta gold zone at its Coasa Gold Project in south eastern Peru. 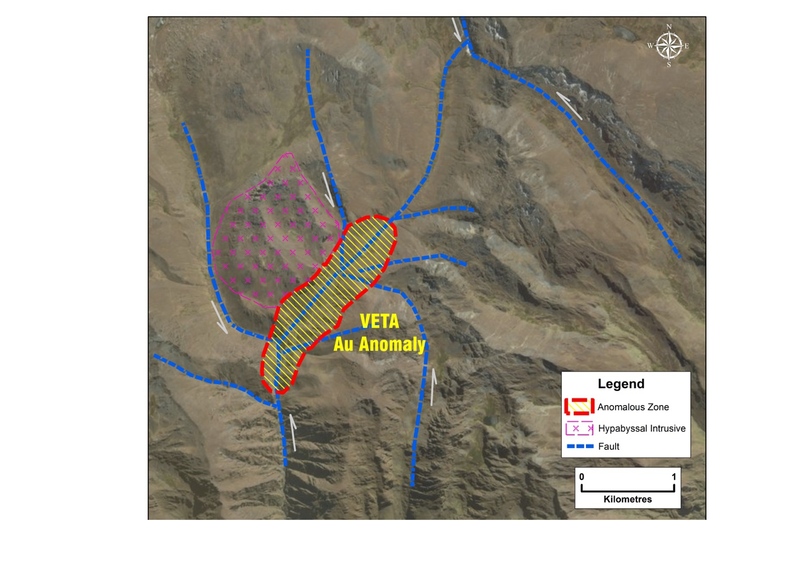 On September 25, 2018, Palamina reported the discovery of 4 visible gold zones at Veta where chip sampling returned up to 620 g/t gold and channel sampling up to 1.8 metres of 19.6 g/t gold (see NR24). Surface gold mineralization at Veta covers an 800 by 500 metre area. The Cayos gold zone is located 1.5 kilometres south of the Veta gold discovery. Andrew Thomson, President of Palamina stated, "The Cayos gold zone is 1.5 kilometres south of the Veta gold zone. The 3 metres of 30.5 g/t gold intersection from Cayos represents Palamina's best channel sample to date at Coasa. Palamina is awaiting results from its heli-borne geophysical study to gain a better understanding of the structures at Coasa and to determine the relationship between the Cayos and Veta Zones. Palamina continues to discover gold mineralization associated with shear zones it believes are related to structural jog zones at Coasa." Members of Palamina's geological team formed part of the exploration discovery team at the Ollachea gold deposits located 65 km northwest of Coasa. The Ollachea gold deposits occur along a structurally deformed east-west trending shear. Similarly, 75 km southeast of Coasa, the orogenic gold mineralized occurrence at La Rinconada, also features a significant deformed east-west inflection zone. Midway between Ollachea and La Rinconada, the Coasa Gold Project also lies along a significant deformed east-west inflection zone at roughly the same elevation. In an attempt to better understand the Veta gold anomaly and to account for the source of orogenic gold mineralization at Coasa, an early "working interpretation" of the structural geological setting is underway. A preliminary interpretation (presented below), displays a meaningful coincidence of a hypabyssal intrusive plug wedged along the northern side of a series of sub-vertical structures having the Veta Anomaly as their common foci. On a macro-scale the structures are intimately associated with a broad series of localized shears diverging off the dominant Phusca shear zone (not shown). Notably, and in contrast to prevailing EW to NW trending shearing on the project, the diagram below suggests the Veta Anomaly could be associated with a NE trending structural inflection or "jog" zone within which mineralizing solutions have been deposited. The Veta and Cayos gold zones have both returned significant gold grades from quartz veins and channel sampling has also confirmed significant gold mineralization within the slate and siltstone host rocks on both. The Veta gold zone occurs in association with a NE trending zone of dilation within a structurally complex series of largely east—west trending secondary shear zones. The heliborne magnetics/radiometrics geophysical survey underway to identify and better understand the relationship of the prospective gold zones at Coasa is nearly complete. Palamina recently contracted a geologist with a structural bias to complete an initial field assessment of the principal structural controls at Coasa. The results of the assessment will be processed alongside the data generated from the aeromagnetic geophysical survey currently being completed. Palamina then plans to contract a specialized consultant to provide an independent structural report in order to assist in the generation of exploration and future drill targets. Palamina Corp. quality assurance/quality control (QA/QC) protocol is administered on all its exploration projects. Prior to delivery of field exploration samples to the analytical laboratory and with the objective to provide an independent check on precision, accuracy and contamination in the laboratory, Palamina QAQC staff insert coarse blank samples, field duplicates and certified standards into the sample stream. To assure best practice compliance, assay results are only reported once the results of internal QAQC procedures have been reviewed and approved. All assays are performed by Certimin S.A. with sample preparation in Juliaca, Puno Province and analytical assays at the Lima office. Reported assay values are uncut. At the laboratory samples are dried, crushed, and pulverized and then analyzed using a fire assay — AA finish analysis for gold and a full multi-acid digestion with ICP-AES analysis for other elements. Samples with results that exceed maximum detection values for gold are re-analyzed by fire assay with a gravimetric finish and other elements of interest are re-analyzed using precise ore-grade ICP analytical techniques.